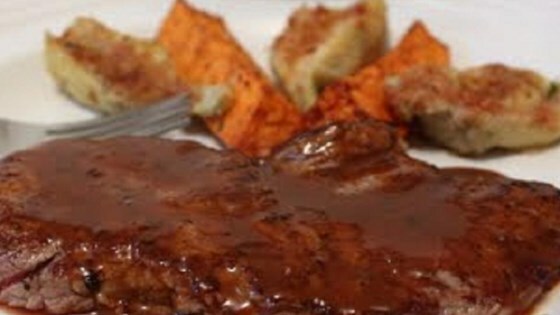 "Everyone knows that a minute steak is only as good as the pan sauce, and this recipes offers an ultra-simple barbeque butter sauce. There's only a small amount of butter, but the way it blends with the beef broth and barbeque sauce, the effect is amplified." Place each steak between two sheets of heavy plastic (or inside a resealable freezer bag) on a solid, level surface. Firmly pound each steak with the smooth side of a meat mallet to a thickness of 1/4-inch. Remove steaks from plastic. Generously season each steak with salt and ground black pepper. Set aside. Combine beef broth, barbeque sauce, hot sauce, and black pepper in a bowl. Add chilled butter to broth mixture but do not stir. Heat oil in a large skillet over high heat until it just begins to smoke, about 1 minute. Place each steak in the pan; sear for 45 to 60 seconds on each side. Remove steaks from skillet and set them aside to rest. Pour the broth mixture into the skillet and bring to a boil while scraping the browned bits of food off of the bottom of the pan with a wooden spoon. Stir occasionally until butter is melted and incorporated, about 2 minutes. Spoon broth and butter mixture over steak and serve. Very simple and delicious. I recommend you watch the video as well. Quick and yummy dinner. absolutely wonderful and simple. I doubled the sauce and DH states I can triple it next time. He used it as a dipping sauce also. thanks for sharing. Can you say yum? My family can't because their mouths are so full! Awesome & Easy. One suggestion, double the pan sauce . Delicious! Made as written.....no changes necessary. Served with mashed potatoes and cucumber salad. Using the leftover steak to make steak and eggs in the morning.